The need to praise God for all He is, has done in the past and what He will do in future should be something we feel inspired to do on a daily basis. However, some may find it hard to fathom all that God has done and is worthy of praise. 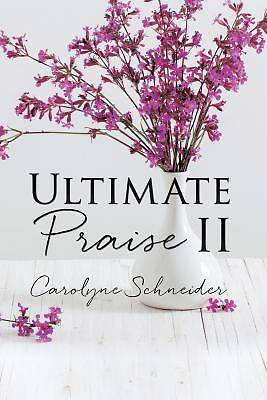 Having recently published her first edition of praises to God, author Carolyne Schneider follows up her first book with Ultimate Praise 2, a new collection of praises and personal declarations of love to the Lord, Savior and Holy Spirit. Separated into different aspects of God's love, from healing to mercy to even laughter, Carolyne encourages readers to see that we should be more aware of what is provided for us daily and worship God for the loving Creator that He is to mankind. Each category of praises also include several scriptural references to direct readers to seek out the Bible and find how God revealed to others the fruits of the Spirit and living for Christ to show our praise of God. There is a section devoted to being a sweet fragrance to the Lord, knowing this is well-pleasing to Him. Carolyne also shares the evidence of God's provision in her own life, healing her from injuries and reminding her that she is special and loved by Him. There are sections, as well, devoted to witnessing God caring for our needs as we experience trouble and desire to know why life has dealt us difficult situations to endure through. Just as Jesus went through death on the cross to bring us redemption and glory to God, we experience trials that bring Jesus to others and glory to God. There is not enough time in the day to praise God for everything He has given and done, but with Ultimate Praise 2, you have the foundation to begin praising God every day, hour, minute and second.